We have been in business for making customized sports balls and uniforms for sports clubs, schools and businesses in North America since 1999. We specialize in making customized soccer balls, volleyballs, footballs and sports apparel. We also have in-stock products which can be ordered online or picked up from our store in Lawrenceville, Georgia. We have now acquired a factory in Asia which mass produces inflatable soccer balls, footballs, volleyballs and sports apparel. All the sports balls produced by us conform to strict quality guidelines and are hand stitched, laminated and printed with high quality inks. We make balls in all sizes and designs. We have the capability to make custom soccer balls in any size & design imaginable, we can produce match balls in high quality synthetic leather such as PU, Korean Ducksung or Japanese Cordley. The balls are fitted with high quality bladders and laminated with mix of polyester and cotton linings for softer touch and feel. We can also manufacture promotional balls in cheaper synthetic leather (PVC or mix of PU/PVC) for promotional and fundraising purposes. Balls can be made in your choice of desired colors and can be imprinted or embossed with your logo at very reasonable prices. The same is true for our apparel range, we can produce team uniforms in your desired design, you have several options to pick from our pre-defined designs or provide us with your preferred design, we can do embroidery work or screen printing as required, names and numbers can also be printed on sports uniforms and tracksuits. There are several fine fabrics available to suit your taste. The delivery timeframe to manufacture and deliver your order from our factory in Asia to anywhere in the USA is between 4 to 6 weeks after the receipt of your order. Click here to view our wide range of soccer balls available from our store and website. Use coupon code NHSCABSB10R to get 10% off your order from our online soccer store. 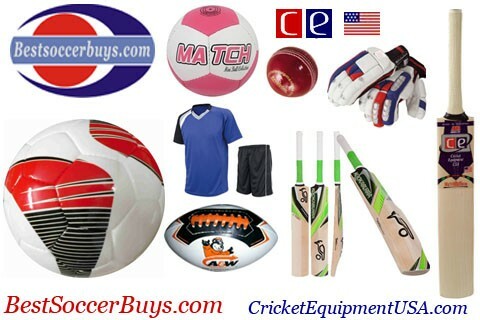 Cricket Equipment USA a subsidiary of Best Soccer Buys Sporting Goods has been supplying cricket bats, balls, gloves, leg guards, bags, uniforms and other protective gear to cricket enthusiasts in USA since 2008. We carry world famous cricket gear brands like Kookaburra, MB Malik, Ihsan and CE. Cricket is a growing sport in USA and gaining fast popularity among mainstream Americans. We are official stockiest of Kookaburra, MB Malik and Ihsan cricket gear in USA. We also make custom team uniforms for several leagues and clubs across the United States. We carry English willow, Kashmir willow and several different types of heavy tennis ball bats along with gear for kids. Our online website has several resources to learn about the sport of cricket as well. Check out or large inventory of cricket bats available for sale along with other cricket items. Use coupon code NHSCACEU10R to get 10% off your order from our online cricket store.